The Gold Coast is an historic district in Chicago, and part of the city’s Near North Side community area. 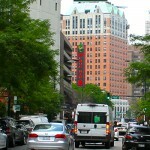 It is usually thought to be the area bounded by North Avenue, Lake Shore Drive, Clark Street, and Oak Street. The neighborhood is an elegant combination of row houses, high-rise condominiums, and mansions, and is one of the most affluent neighborhoods in the United States. The Gold Coast has many high-rise apartment and condo buildings with sweeping views of the lake and luxurious amenities. Beautiful historic row-homes also sit proudly on tree-lined streets, giving the neighborhood real historic charm. Although prices tend to be somewhat high, there are still good opportunities to live in this fantastic neighborhood, for both buyers and renters. The Gold coast is bordered by Lake Shore Drive, so access to this storied road is very easy. In addition, the CTA Red Line runs through the Gold Coast, with a stop at Clark and Division. Residents will find it easy to access all parts of Chicago.